iFFmpeg is a comprehensive media tool to convert movie, audio and media files between formats. The FFmpeg command line instructions can be very hard to master/understand, so iFFmpeg does all the hard work for you. This allows you to use FFmpeg without detailed command-line knowledge. Only works and optimised for macOS 10.10 or higher. Revamped GUI to improve workflow. Batch view is now split in Source and Target panes. You can now also change the video and audio codecs directly in the right pane. Video and Audio now have 'Advanced' buttons in the right pane. This opens the relevant advanced options of the selected video or audio codec. Now shows the batch number for each batch. Now uses system font instead of system_small font for better reading. You can now use the cursor buttons to set the trimming times. Auto show settings window after adding audio, filter, trimming, metadata and chapters. When adding external audio, the dialog now uses the source path as the initial folder. When changing the destination path, the dialog now use the source path as the initial folder. Changed font for the FFmpeg Info, Detailed Info and FFmpeg log windows to Courier. Now shows the physical file size instead of the data length for media files. Renamed option ‘Convert H264 bitstream from length to start code prefixed mode’ to ‘Convert H264 or HEVC bitstream from length to start code prefixed mode’. CRF value can now be set to 69. When setting video or audio to passthru ff·Works checks if filters are present. Renamed video filter ‘Time Cutter’ to ‘Time Trimmer’. Selecting a HEVC preset, always uses HVC1 as FourCC so it is playable with latest macOS versions. A Save dialog window is now used to save user presets. When changing destination path/filename, the dialog now uses the movies path as initial folder. Now displays the file size correctly. When pausing encoding, it is now possible to fully stop encoding. Select a batch that is encoding now shows a ‘encoding in progress..’ warning. Removing the external audio file from a audio stream, now selects the source audio stream when available. The Watchfolder window can now be scaled. Trimming timeline now shows thumbnails. The Trimming max frame value is correctly set referring to the source FPS. Selecting MPEG container now uses AC3 as the default audio codec. Now automatically adds Video and Audio PTS filters when using hardburning subtitles and trimming. Added magic stick icon button to show the ‘Passthru Wizard”. Added x265 option “Force singling of HDR parameters in SEI packets”. Added x265 option “Limits frames for tone mapping information inserted as SEI message”. Added support for DNxHR 8bit and 12bit. Added option ‘DNxHR profiles’ (444’,’HQX’,’HQ’,’SQ’ and ‘LB’). Added support for 1440x1080 (HD1080 Wide screen) for DNxHD. Added support for recent files in menu. Added preference option ‘Show PassThru Wizard when adding batch files’. Added preference option ‘Always request for destination filename’. Added preference option ‘Show Edit window after adding Audio, Subtitle, Filter, ..’. Added preference options ‘Prefix’ and ’Suffix’ for creating filename. Added preference option ‘Default Subs Charset Encoding’. Added preference ‘When done’ option ‘Shut down system ones’. Added preference option ‘Show All Encoded Files.’ Only opens the Finder when all batch files are processed. Added preference option ‘Probe size for scanning files”. Added preference option ‘Analyse duration for scanning files”. Added ‘Advance’ button to directly access codec specific options. Added audio filter Channel Mapping. Added ‘Set Channel Layout’ option. Added video filter ‘Set SAR’. Added video filter ‘Set DAR’. Added video filter ‘Background Blur’. Added option ‘First Field’ option. Added option ‘Start Frame’ option. Added MP3 and MP2 support for MP4 container. Added option ‘Render Real Timecode’ for Render Timecode filter. Added option ‘Render Custom Timecode’ for Render Timecode filter. Added option ‘Render Frame Number’ for Render Timecode filter. Added option ‘Render Frame Type’ for Render Timecode filter. Added OPUS support for MKV and WEBM containers. Added PCM_S32LE support for AVI containers. Added support for HAP codec in MOV containers. Added HAP quality options ‘HAP’, HAPAlpha’ and ‘HAPQ’. Added AAC codec for AVCHD (.mt2s) containers. Added support for video hardware accelerated videotoolbox encoding. Added new advanced page for hardware accelerated video encoding. Added Apple VDA hardware decoding option. Added Videotoolbox hardware decoding option. 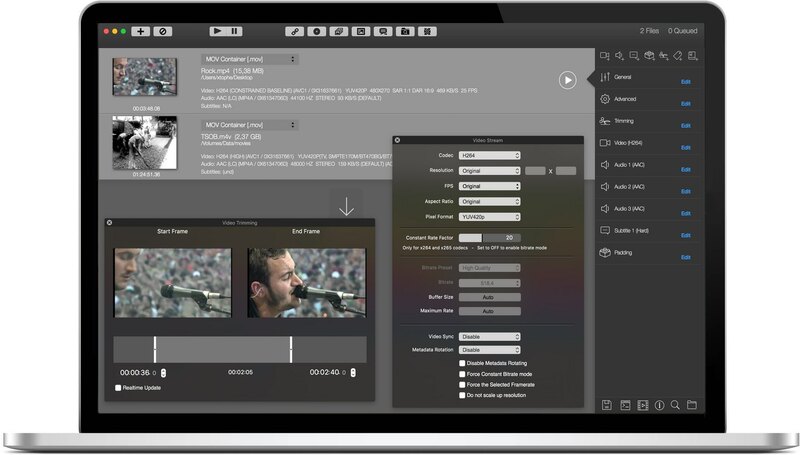 Added Videotoolbox hardware encoding option. Added Videotoolbox option ‘More Frames Before Start’. Added Videotoolbox option ‘More Frames After End’. Added Videotoolbox option ‘Allow Software encoding when Hardware encoding fails’. Added CoreAudio hardware encoding option. Added support for extracting Close Captions subtitles. Added ‘Audio Track Name’ metadata. (Matroska container only). Added ‘Subtitle Name’ metadata for soft subtitles. Added option ‘Motion interpolation mode’. Added option ‘Motion Estimation Mode’. Added option ‘Algorithm for Motion Estimation’. Added option ‘Motion estimation search value’. Added option ‘Enable variable-size block motion comp’. Added option ‘Scene change detection method’. Added option ‘Scene change detection threshold’. Added option ‘Shift input timestamps to start at zero (needs copy timestamps enabled)’. Added audio channel layout ‘hexadecagonal’ and ‘hexagonal’. Added audio filter ‘Audio Merge’. For merging audio streams to one audio stream (both embedded and external audio files). Added option ‘Merge Channel Mode’. Added option ‘Merged Channel Layout’. Added 8x ‘Audio Stream’ selectors. Added 8x ‘Set External Audio File’. Added support for H264RGB video codec for MOV, MP4, MKV and AVI containers. Added preview for Cropping and Padding video filters. Added Video Filter ‘Color Space’. Added option ‘Specify all input color properties’. Added option ‘Specify all output color properties’. Added option ‘Specify input colorspace’. Added option ‘Specify input transfer characteristics’. Added option ‘Specify input color primaries’. Added option ‘Specify input color range’. Added option ‘Specify output colorspace’. Added option ‘Specify output transfer characteristics’. Added option ‘Specify output color primaries’. Added option ‘Specify output color range’. Added option ‘Specify output color format’. Added option ‘Do a fast conversion, which skips gamma/primary correction’. Added option ‘Whitepoint adaptation mode’. Added ‘Hide ff·Works’ (Watch folder window). Added ‘Hide Dock Icon’ (Watch folder window). Added ‘Set Audio PTS’ expression. Added VP8 ‘CPU used’ option. Added help tags for all VP8 options. Added VP8 ‘Datarate undershoot’ option. Added VP8 ‘Datarate overshoot’ option. Added VP8 ‘Noise sensitivity’ option. Added progress spinner when importing files. Added ‘Auto create DASH Manifest file”. Added ‘Create separate Chunk files’. Added ‘Minimum Segment Duration’ option. Added ‘Remove non-DASH files when finished’ option. Added DASH resolution and bitrate list. Added support for .m4s files. Added X-Offset and Y-Offset options for Watermark position. Added support for .drc , .gifv, .mng, .yuv, .m4p, .svi, .f4a and .f4b files. Added option ‘Only Keyframes’ for exporting movie to image files. Added option ‘Prevents clipping when rematrixing’ (for audio filter resampler). Added option ‘Enable Alpha Channel support’ for WEBM containers. Added option ‘Disable’ to Video Size. Added video filter ‘Pixel Format’. Added option ‘Set Pixel Format’. Added 24bit and 32bit support for MXF containers. Added support for hevc_mp4toannexb bitstream filter. Added support for exporting to TGA images. Added several 10bit ,12bit, 14bit and 16bit pixel formats. Added AC3 option ‘Use Channel Coupling’. Added AC3 option ‘AC3 Coupling Start Band’. Added FLAC option ‘FLAC Compression Level’. Added MP3 option 'Use Average Bitrate'. Added MP3 option 'Disable Bit reservoir'. Added higher preset frame rates (70, 75, 90, 100 and 120). Added ‘Basic Information’ and ‘Advanced Information’ options for the Media information window. Added ‘SAVE’ and ‘PRINT’ buttons for the Media information window. Added hvc1 tag when encoding to HEVC (to make files macOS 10.13 compatible). Added support for IINA and MPV players for previewing. Added support for IFO files (for using the correct subtitle color when copying dvd subtitles). Added option “Enable loading of external tracks” (For Quicktime reference file). Added option “Allows loading of external tracks via absolute paths,” (For Quicktime reference file). Added .yuv extensions for MOV and MKV containers (for using Rawvideo). Improved compiling Commandline when encoding to rawvideo. Improved bitrate quality settings for several video codecs. Improved rendering a background for subtitles (hardburn). Improved handling dvb_sub subtitles for MPEGTS containers. Improved setting the video size in the Export to Images sheet. Improved Watchfolder: You can now hide the ff·Works window to run in the background. Improved compiling command line when using video passthru. Improved compiling video filters (order). Improved burning subtitles and trimming is enabled. Fixed options ‘Strictly enforce gop size’, ‘normalize adaptive quantization’ and ‘always try a mb with mv=<0,0>’ to work with the latest FFmpeg builds. Fixed Tune and Preset options when encoding to HEVC. Fixed issue encoding to DTS audio codec. Fixed issue setting the audio codecs for AVS and RealMedia containers.